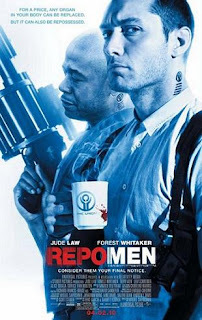 All these are made possible in Repo Men which takes place in 2025 where everybody can go on living their lives like normal by just replacing worn-out/problematic parts/organs with bio-mechanical ones. Come on, "You owe it to yourself. You owe it to your family", right? That's the sales pitch.. But what they don't tell you is what's written in the fine print - payment. If you fall behind in your payments (most people do because mind you, the interest sky rockets year after year), a "repo-man" is sent after you to reclaim the organ. Just like if you fail to pay your car installments, you can bet it'll be towed away. Only in the former, its the organ they are repossessing and to get to it means they'll have to CUT you open. In most cases these results in d-e-a-t-h.
...you'll have to watch the movie to find out what happens after. Well, I'll tell you this much. It's 2 hours of adrenaline rush and blood and gore. It'll also have you in stitches. Can you imagine, I was laughing away at a bloody fight scene? You must think I'm psycho to lol when people are getting killed but you gotta watch it to be in my shoes. The gore and humor manages to go hand-in-hand really well. The ending also elevated the movie to another level and honestly it kinda caught me off-guard too. ohh, asking ur 2 brave frens for the next movie?? by all means, go ahead!! LOL blueks! Repomen,one of the movie bring out the situation will happen in our future, but certainly not that over as in the movie's. Repoman is most innocent in the movie even though his best friend not really want to make the thing worst. The last scene made me little touching that even his best friend 'betrayed' him, but in Repoman's heart, they are best friend still even though e'thing causing by his best friend. and yeah..the ending really caught me off-guard. dont really like the ending though. but then it's actually thr highlight of the movie i think! lol how can you be touched, if he knows what he'll end up as I don't think he would still think they are best friends.. wtf!? i dont wanna watch the movie, but wanna know the ending!!! REPOMEN for this one, also a thumbs up for me. love the ending, but many did not like it. yeah, the ending was a good twist..oh, i guess ppl wanted a happy ending, huh..
Me! MiNdBOx - What Do You Got?